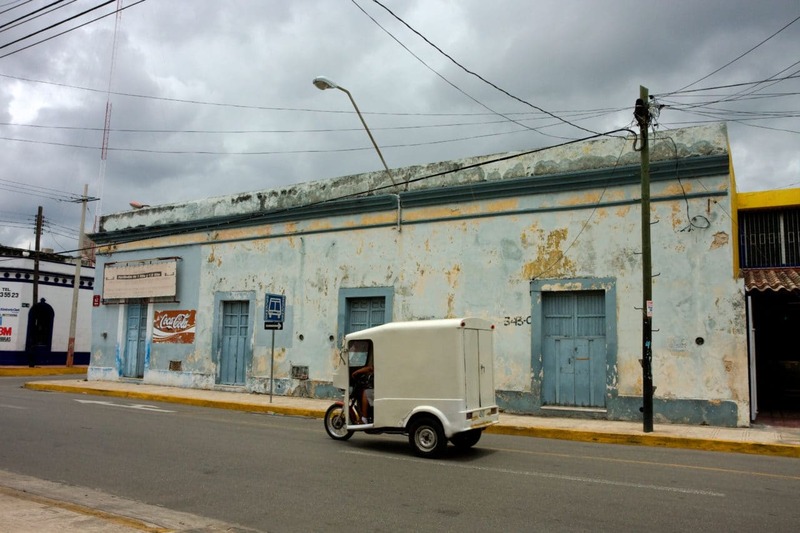 Today I took another one of my photo walks through the capital city of Yucatan State, Merida. This first image was shot from the balcony of the backpacker hostel Zocalo, around sunset. 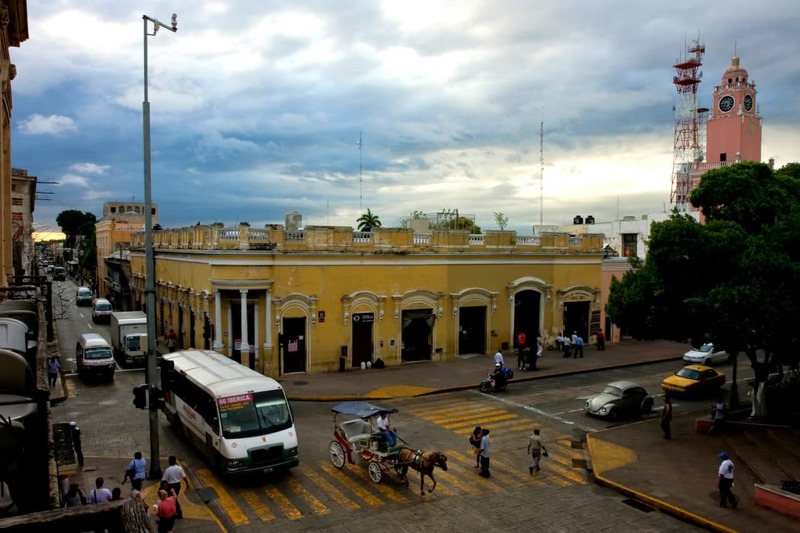 It gives you a great view of the central plaza of Merida. At $135 pesos a night (about $10 US) it’s right in the heart of it all. Down in the plaza, I was “befriended” by 3 locals (at different times) who spoke surprisingly good English. After the 2nd one, I figured out what was going on. They were very smooth and laid back. They would ask you where you were from and become very helpful with recommending sights to check out. Over the course of 20 minutes, they would casually get to know you and tell you about themselves. But then, at the end of the whole conversation, they would all “recommend” that I visit a particular Mayan store to pick up an authentic hammock or Panama hat. 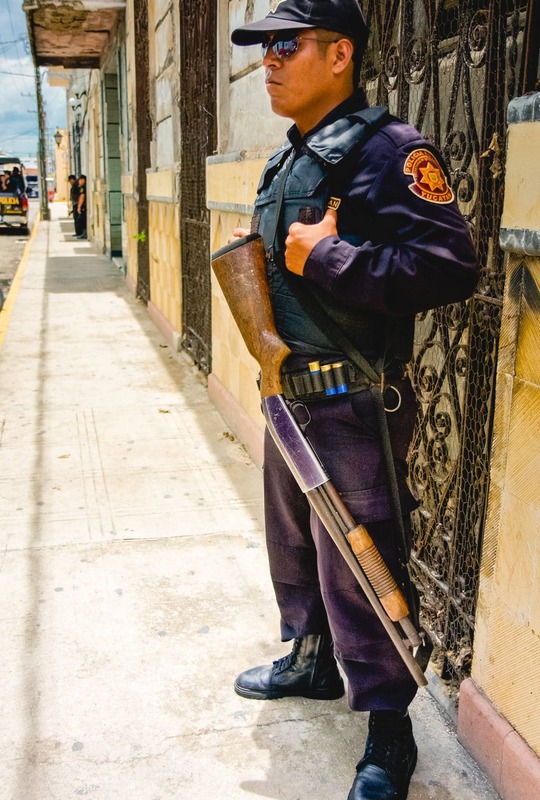 Later in my walk, I saw about 20 Mexican Police guarding a large, old building. I have no idea what for, they wouldn’t tell me. They were armed with shotguns, and there were 3 or 4 trucks full of them, along with a couple guys at the doorways. I walked up and tried to talk to them. One spoke pretty good English and proceeded to tell me how much he loved Michael Jackson and President Obama. He said his kids were learning English in some special school. After our chat, I got permission to take a few photos from the guy in charge. Next, I found this dilapidated building with character on the street that had very little traffic driving past it. I hid behind a corner and started snapping shots whenever a vehicle drove by. It was always a surprise what passed in front of me, and I just kept shooting until I got something worthwhile. This little midget delivery truck was just what I was looking for! These little scooter trucks are all over the place down here. I guess they can get around the narrow streets easier than larger trucks. hah, so many hammock scams. I bought a hammock in Merida a few years ago – the shopkeeper swapped it for a child-size one before I left the shop. Thanks for the article and for publishing a nice site. I have been seeking savvy information on travel tips and can put this information to practice. I have found it difficult to find good recommendations, as there are so many web sites with garbage posts. Please keep the good stuff coming! Hey Matt. I'm new to your blog as of today, but will be following you in the future. Keep up the good work. Your stories and pictures are all quite enjoyable. I hope the rest of your Yucatan trip is a blast. Be safe and travel well!